This picture of the galaxy cluster ACT-CL J0102-4915 combines images taken with ESO’s Very Large Telescope with images from the SOAR Telescope and X-ray observations from NASA’s Chandra X-ray Observatory. 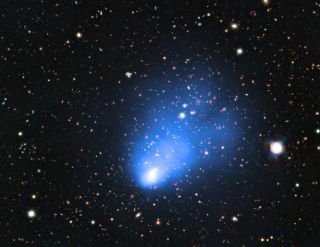 The X-ray image shows the hot gas in the cluster and is shown in blue. This newly discovered galaxy cluster has been nicknamed El Gordo — the "big" or "fat one" in Spanish. It consists of two separate galaxy subclusters colliding at several million kilometres per hour, and is so far away that its light has travelled for seven billion years to reach the Earth. AUSTIN, Texas — In an increasingly competitive environment for research grants from dwindling federal budgets, many scientists are eager for clues on how to secure funding. Not reading the NSF's Grant Proposal Guide: "Don't waste your time reading these documents. They're nothing but detailed descriptions of program objectives, proposal requirements, and formatting guidelines." Ignoring the broader impacts of your potential project: "Just because you're asking a federal agency for taxpayer dollars, that's no reason to address the agency's review criteria. Your brilliance transcends such petty concerns." Write for your friends: "Everybody is either already working in your area or wishing they could — there's no need to impress the latter. Jargon can be taken for granted." Show you care: "For a personal touch, refer to female graduates of your Ph.D. program as "Ms." Instead of "Dr." to emphasize your inclusiveness." Avoid unpleasantness: "Did you just get an email advising you to fix a problem in your submitted proposal? Ignore it! NSF gets so few proposals that they'll be grateful for yours no matter how non-compliant it is." Proofreading is for wimps: "Nobody equates typos and other errors with being sloppy. It's not like you're trying to convince anyone you can carry out a complex project." You can follow SPACE.com assistant managing editor Clara Moskowitz on Twitter @ClaraMoskowitz. Follow SPACE.com for the latest in space science and exploration news on Twitter@Spacedotcom and on Facebook.